Art project needs only one more country in the soil collection phase. Support will provide transportation to North Korea. 27 backers pledged $10,555 to help bring this project to life. Large scale art project collecting soil from each country in the United Nations, to be placed early next year in a 196 panel fresco measuring 50 feet by 50 feet. After nearly ten years, the collection phase will be complete with the addition of soil from North Korea, otherwise known as the DPRK. Once the collection of DPRK is complete, careful planning can begin with facility rental, materials purchasing and scale modeling. I have been seeking approval for the visit to North Korea for several years and just recently received permission for the purpose of the soil collection. I NEED YOUR SUPPORT IN THE TRAVEL to complete Phase 1. The trip is planned for the end of August 2011, just a few weeks away. Why $8,000? after producing the gifts (rewards) I should be left with enough for coach class ticket, food and lodging. If I am blessed with more funding, it will go directly to the Phase 2 production budget for the 196 panel artwork that will be yet another monetary challenge to hurdle once all of the soil samples are obtained. When will you travel to North Korea? The end of August 2011 for one week. How much has the project development cost you over ten years and where did the money come from? I have devoted over 12,000 hours (25 hrs/week). Hard costs for studio rental, utilities, website maintenance, freight (for soil packages) journals and subcontracting which has averaged $25,000 per year, and has come from my personal art sales and generous loans from family, friends and patrons who believe in the magnitude of this project. If there are now 193 member states in the UN, why is it called CommonGround191? The project began in 2001 when there was 191 members. Since then Serbia- Montenegro became independent in 2006 and just recently (July 14, 2011) South Sudan was added. I just decided to stay with 191. Who knows, maybe more countries will join the UN in the future. Where do you expect to display the final 196 panels? Not sure, any suggestions? The plan is to create the panels so they can be exhibited in 3 ways: 1) 14 vertically and 14 horizontally, 50'x50' 2) side by side, 700 feet long 3) 2 vertically, 350 feet. Each arrangement will convey a different abstracted topic. Again, this is phase 2 and completely dependent on the success of Phase 1 (Soil Collection). If I'm rewarded with the necklace, how do I know all of the soils are in the bottle? You and I won't, but I can assure you that they will be blended and mixed for hours? From there, we have to ask a mathematician. Are you a little crazy? Likely! 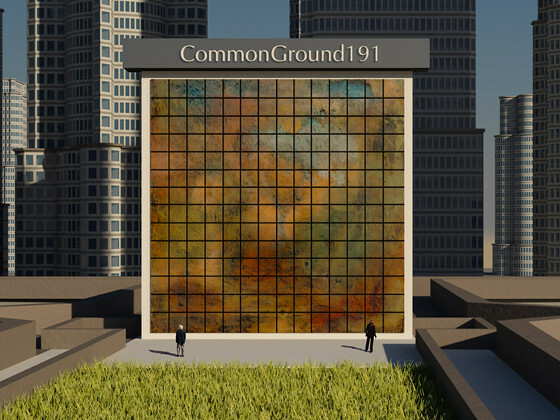 The Concept Rendering for Phase 2 of CommonGround191 is an 18 x 24 inch signed print that is suitable for framing. Below is the Poster created for a general scale study and it's important to note that the finished piece (all 196 panels) will look very different from this rendering. The artwork in the rendering is blend of two artworks produced by Gary and is representative of the style in which he creates. 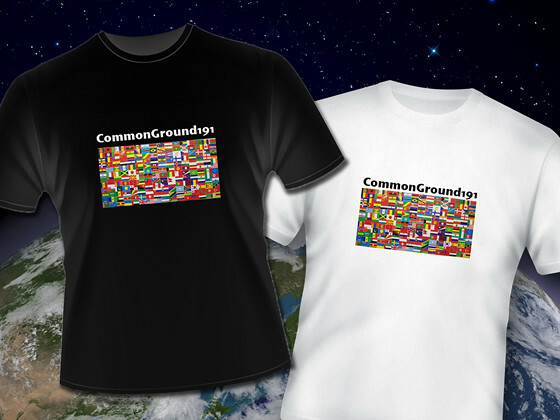 And of course, CommonGround191 has an official T-shirt you can wear to support the project long into the future! These are nice, high quality, well crafted T-shirts that will provide years of wear and keep you looking good! Below is an extraordinary jewelry piece that will mesmerize your friends when you tell them that the bottle contains the soil of all 193 Members of the United Nations! The soil for this reward will be mixed together into one and then it will be shaken, stirred, spun, rattled and tumbled for a good long time to ensure the odds that each necklace bottle will have a maximum probability of containing a trace of soil from each and every country! The actual soil mix was insured for $60,000, and this is a very rare and unique piece of jewelry and history. Be sure to check out the JOURNAL at www.commonground191.com to see where the soils were gathered. Once again, I thank you for participating in this project and symbolically being a part of something that is much larger than ourselves. I wish you all the best! Will add your name to the website "thank you" section as a 5 Star Contributor and send e-mail image of my actual collection in the DPRK. Remember, the final process is abstract and I don't know how it will look. We will also add your name to the website "thank you" section as a 25 Star Contributor and send e-mail image of my actual collection in the DPRK. A project's tee shirt displaying the the flags from 193 UN member states, (black or white-medium or large) of excellent quality! We will also add your name to the website "thank you" section as a 39 Star Contributor and send e-mail image of my actual collection in the DPRK. 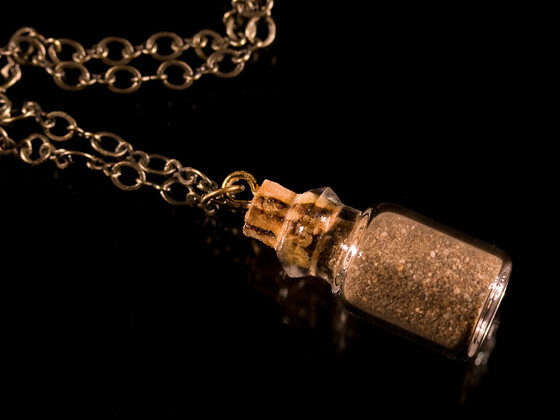 The bottle necklace-containing a mix of all 193 soils in the collection. (the soils have been insured for $60,000) Please be careful, you will be asked by friends and strangers : "What is that?" ONE PLACE THE WORLD IS AT PEACE. We will also add your name to the website "thank you" section as a 191 Star Contributor and send e-mail image of my acutal collection in the DPRK.